PE-300 provides a simple way to test and verify a NON-standard/passive PoE to set up No-standard PoE system and help to troubleshoot connection issues. It performs both one-site PSE testing for voltage, power source type and polarity, and Inline (PSE/PD) testing, which real-time monitoring and detect the input current of a PD connected, and display in rotation between voltage, current and power (Watts) to ensure that a powered device actually need. A passive PoE is not compatible with the 802.3 af/at standard and it does not perform a handshake and the power is always on, furthermore due to the difference in voltage rating, if you connect the wrong voltage then may cause permanent damage to the device. So it is important use the tester to check the PSE type and output voltage and to know what PoE voltage your PDs required before plug in the PoE jack and powering it up to avoid damage the PD. 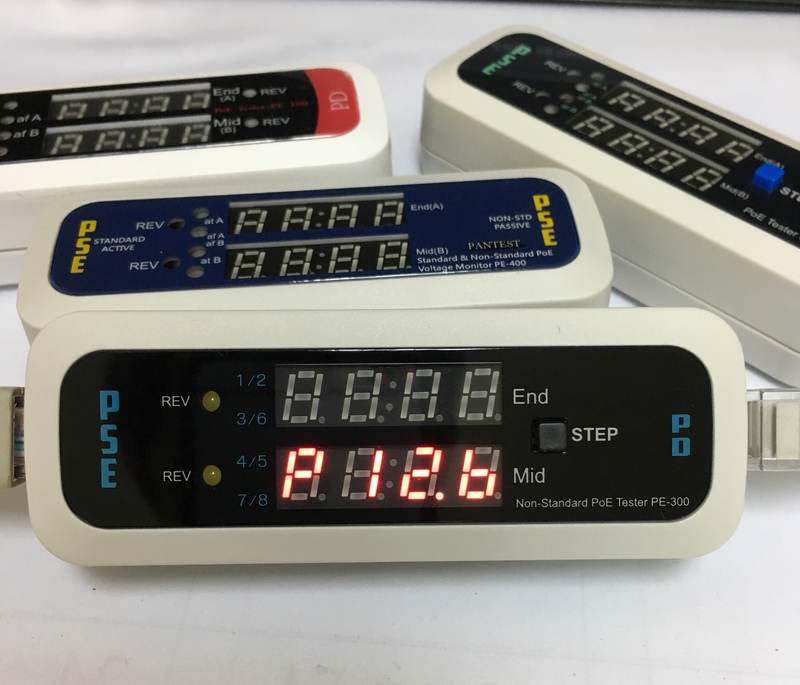 In-line testing measure and display accurately available voltage from the PSE and the power to the PD to ensure you PoE device can function correctly. The tester PE-300T built-in a Gigabit Ethernet/PoE+ Transformer to isolate data passes and measure power without interruption of data. It also equipped with a step button for selecting specific data for easier reading. PE-300 is a handy professional diagnostic tool for speeding up installing and troubleshooting NON-standard PoE system, combines with PE-200 standard PoE tester which are the must have tool for PoE, IT and CCTV installers to test, verify and complete PoE system solutions. Determines if PoE switch/injector has NON-standard/passive PoE capability and display power at PD connected. Performs both one-ended PSE testing for voltage & polarity and Inline (PSE/PD} testing for power (Watts). Determines a NON-standard/passive PSE, and displays voltage and/or polarity and power source type help you to get a right PD. In-line testing measures and displays in rotation between voltage (Volts) current (Amps) and power (Watts). Determines the values of power to ensure that a powered device actually need. PE-300T built-in Gigabit/PoE+ Transformer to isolate data passes, measure power without interruption of data. Voltage Range: 12V to 60V. Max Current: 2 Amps each pair total 4 Amps for PE-300, 1 Amp each pair total 2 Amps for PE-300T. Ensuring no damage to non-PoE or proprietary PoE equipment. Equipped with a step button for selecting specific data for easier ready. Plug and play for ease of use, with battery-free operation. Display in rotation between Voltage (U), Current (A) and Power (P).  2 yellow LEDs indicate reversed polarity for power type. PE-300 - 2 Amps for mode A & mode B, total 4 Amps. PE-300T - 1 Amp for mode A & mode B, total 2 Amps. PE-300T support 10/100 and Gigabit data rates, isolated data passes through for all 4-pair. Inline (PSE/PD) testing – Voltage, Current and Power, and power source type and polarity. 32°F to 122°F ( 0°C to 50°C). 99 x 36 x 26mm / 3.9 x 1.4 x 1 inch / 0.1lb/1.6oz.